ELF Antennas | VLF Antennas | LF Antennas | LF Engineering Co. The L-600S is designed with the serious experimenter in mind. The L-600S is an effective H-Field receiving system for use in EMI noisy areas, or within E-field attenuated areas. The directional loop design in combination with the receiver's high pass filtering, greatly reduces unwanted noise and hum. Frequency response is 300 Hz to 30 kHz (broadband). The 24 inch square PVC loop may be broken down into components for storage. 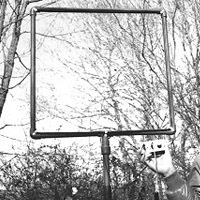 The loop antenna and receiver may be hand held or tripod mounted. Switchable high pass filter for noise reduction. Tape recorder/sound card and earphone outputs included with the ELF receiver. The L-111 System provides full coverage of the LF spectrum from less than 10 kHz to 530 kHz. The L-111 combines the proven L-400B active antenna with a sensitive LF to HF converter. The externally mounted LF converter contains a low impedance wide dynamic range balanced mixer, with RF, IF and local oscillator filtering. The converter's high L.O. rejection greatly improves reception below 10 kHz and its sharp roll-off filter characteristics eliminate BC intermodulation. Receiver tuning is between 4.0 MHz and 4.5 MHz. Supplied with fifty feet of RG-174/U cable. AC supply included. An internal voltage regulator provides better than +/- 1Hz frequency stability. The L-400B active antenna is a compact 26 inch fully sealed e-probe designed for receiving within the VLF and LF spectrum. The versatile and proven reliable L-400B may be used with all 50 to 100 ohm input receivers and converters. The L-400B broadband filter design enables you to effectively receive the entire LF spectrum from <10 kHz through 530 kHz without the need for a tuner. The antenna has very high E-field sensitivity with the advantage of excellent BC intermodulation rejection with its sharp roll off filter. The antenna is omni-directional allowing for various installation configurations and for use as a portable antenna. Supplied with fifty feet of RG-174/U cable. AC supply included. The LF active broadband coaxial wound loop is used in conjunction with an LF receiver input circuit. The design consists of a balanced peaked lowpass coaxial design providing exceptional sensitivity and directivity. Frequency response is 10 kHz to 500 kHz (broadband). The 24 inch square PVC loop may be broken down into components for storage. The loop antenna and receiver may be hand held or mast mounted. The M-601C is commercially rugged and suitable for outdoor installations. Proven reliable, and used in installations around the world for more that ten years, the M-601 is considered a standard among professionals as an excellent source antenna for distributed communications and home entertainment systems. Operating between 530 and 1750 kHz, the high impedance E-field antenna contains a high gain signal amplifier and high pass filter for reduction of lower frequency interference caused by dimmers and power lines. The antenna is easily pipe or mast mounted. Supplied with fifty feet of RG-174/U cable. AC supply included. The AM BC active broadband coaxial wound loop is used in conjunction with an AM broadcast Receiver. The design consists of a balanced peaked lowpass coaxial design providing exceptional sensitivity and directivity. Frequency response is 530 kHz to 1720 kHz (broadband). The 24 inch square PVC loop may be broken down into components for storage. The loop antenna and receiver may be hand held or mast mounted. Broadband active antenna designed for a wide spectrum of ship-board marine applications including A2/A3/A4 GMDSS, NAVTEX, DGPS, LORAN, AM BC, and general shortwave listening. Supplied with universal mount. Low Frequency active antenna designed for ship-board marine applications including NAVTEX Weather Service, DGPS, NDB Navigational Aids, Time Standards and LORAN. Supplied with universal mount. The H-800 SkyMatch is a compact broadband active antenna that effectively covers the longwave, mediumwave and shortwave bands (10 KHz through 50 MHz.) The antenna's active components are housed in a 26 inch fully sealed probe and powered through a coaxial feed from the remote coupler interface at the receiver end.The H-800 is an alternative antenna to a long wire system where space is limited. Great for portable operation using internal batteries. Supplied with fifty feet of RG-174/U cable. AC supply included for fixed operation. L-111 / PCB circuit board is from the L-111 VLF/LF converter. For use with long wire antennas or with the L-400B active antenna. Receiver tuning is between 4.0 and 4.5 MHz. Assembled and tested. This unit is ready for custom assembly into your receiver or instrument box. Instruction Sheet provided. The N-300 Ground Isolator is designed for isolating ground loops and noise. The N-300 is used between the antenna coax line and the receiver, (not for transmitting). Band width is 10 kHz to 4 MHz. The N-300 consists of a bifilar wound torroid with a 50 ohm impedance. A neon discharge tube is used for ESD protection. Provides an impedance matched 50 ohm coaxial connection for two receivers when feeding signal from one active antenna, or when combining two different antennas (L-400B and H-800), or combining an active antenna and a wire antenna into one receiver. Provides an impedance matched 75 ohm coaxial connection for two AM BC receivers when feeding signal from one M-601 antenna, or when combining two antennas for one receiver or distribution amplifier. Printed circuit board completely wired and tested with same specifications as L-202B. Ready for custom assembly into your receiver or instrument box. 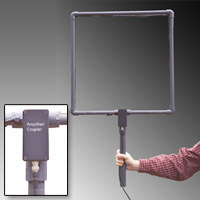 Provides a wireless connection between the M-601C active antenna and a portable receiver's internal loop stick antenna. The typical frequency response is from 200kHz to 4 MHz. Fixed tuned LF/VLF preamplifier designed to improve your receiver or converter's VLF and LF reception for mainly use with a long wire antenna. The low noise amplifier boosts gain throughout the entire LF spectrum eliminates bc intermod and provides flat coverage between 10 kHz and 520 kHz. Active Antennas and Couplers with BNC F Connectors are available as an option for Models: H-800, M-601C, L-400B and L-111. The cable to the antenna is user supplied, which can be most any type of 50 or 75 ohm coaxial cable with BNC M connectors. Cable runs between the antenna and receiver can be made up to 200 feet using 1/4 inch cable, or 600 feet using 1/2 inch cable. Add $20.00 for active antennas with BNC option. 3M™ Scotch-Seal™ 2229 Mastic Tape, is a durable mastic tape product, designed as the best weatherproofing sealant for electrical connections, splices and feed-throughs. Easily wrapped and stretched around irregular surfaces, or molded as a plug to form a solid water-tight block. Self-healing and UV resistant with a high dielectric rating. Available in rolls of 1 inch x 10 feet, $18.00 each, or in economy lengths of 1 inch x 2 feet at $4.00 each. Add $2.00 postage per order (free shipping with any antenna order). 3M™ Scotch-Seal™ is a Trademark of 3M Corp. U.S.A.
For input/output connector interface change. Adapters may be combined with other mating adapters. Postage $2.00 (free shipping with any antenna order). BNC Male / RCA Male Jumper. RG/58/U, 6 ft. Postage $2.00 (free shipping with any antenna order).